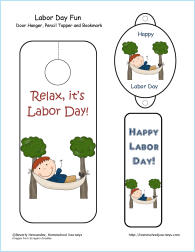 The new Labor Day Printable Pages are up! 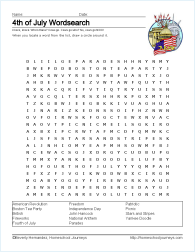 The 7-page printable activity pack is perfect to remind us about the history of Labor Day. To many of us, Labor Day marks the end of summer and the beginning of the school year. But Labor Day is much more than that. The working conditions in America have come a long way in the last century thanks to the efforts of Peter McGuire, the “father” of Labor Day. How did he make a difference? Have a fun and relaxing Labor Day with your family! There’s nothing like a fun day at the beach in the summertime! Living in Southern California, we’ve even gone to the beach in the wintertime. 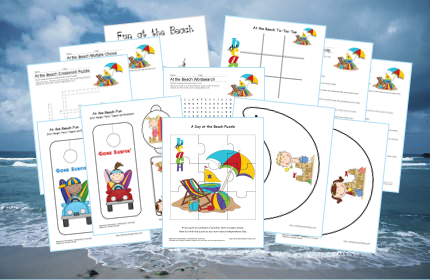 Here’s a set of beach-themed printable activities for your kids. 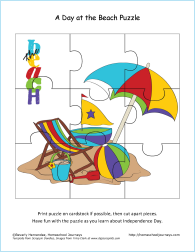 They’ll learn terms related to the beach, make a sun visor, color a picture, play a game of Tic-Tac-Toe and more. If you make it to the beach this summer or even a river or lake, have fun, stay safe and wear sunscreen! In America, Independence Day is celebrated each year on July 4th commemorating the adoption of the Declaration of Independence on July 4, 1776. It is a national holiday and is celebrated with community picnics and parades during the day, followed by spectacular fireworks displays in the evening. I’m working on printable pages for the holiday which should be completed by the weekend. 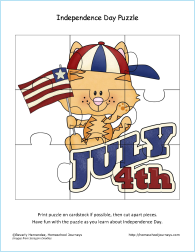 But in the meantime, here’s a 4th of July Wordsearch and some of the activities from Flag Day and the Summer Adventure Planner will also work. Check back on Monday for the new printables. 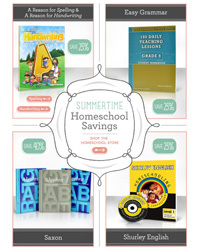 As I was working on the Math Curriculum Guide, I realized that CBD (Christianbook.com) has a summertime homeschool sale going on and Saxon books are 40% off until June 30th. They are also offering 25% off on A Reason for Handwriting and Spelling, Easy Grammar and Shurley English, all until June 30th. 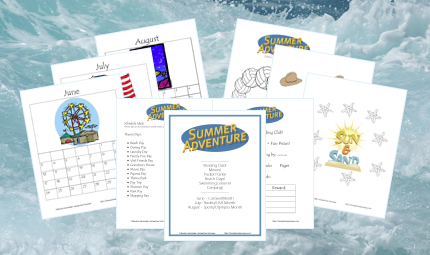 This printable Summer Adventure Planner is your ticket to a fun-filled summer! We have found that the key to having fun with kids is to plan ahead. We’ve done the brainstorming so you can fill out your calendar and get to having summer fun. Choose the pages that best fit your family and themes. Here are helpful tips to help you get the most out of your summer adventures. The summer months have been divided into 3 themes: June – Carnival, July – Rodeo/USA, August – Sports/Olympics. 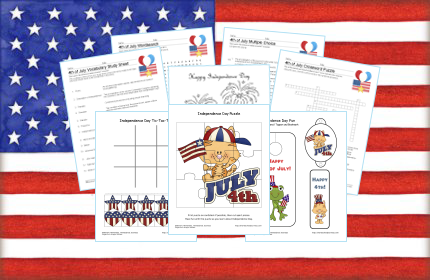 Use these themes as you buy reward stickers, plan games, activities and outings. You can be as simple or elaborate as you’d like. Having a calendar filled out and posted on the wall will give everyone an idea of the fun to come! Fill in a simple activity on each square to bust those summer boredom blues! These will be different for every family, but we’ve included sample ideas to get you thinking. Some families will want to do more, some less and some will want to tear up the schedule and forget it! Do what works best for your family. We’ve included forms to keep track of clubs and charts for stickers and rewards. We have a system set up with small rewards in a “treasure box.” Treasure is earned after a sticker chart is filled, usually about 5-7 stickers. Choose a method that will work for your family. Here are some things to consider: Rewards should be simple and easy to earn. Some reward ideas are: stickers, erasers, pencils, small candies, small notebooks, party supply-type toys, etc. Rewards can also be for experience sharing, some ideas are: going for ice cream, playing a game with mom, having a water fight, etc. The thing to keep in mind is that you’ll want the kids to be rewarded often to keep the momentum of the clubs going. Packets are to keep learning happening in a fun setting during the summer. Packets are also something to do when kids are bored or on a long car trip. Keep them simple and fun! 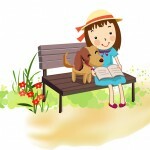 Homeschool Buyers Co-op also has a Summer Fun Reading Program for their members. Each week during the summer, they hold a drawing awarding two students with a prize. At the end of the summer, they hold a drawing from all the entries for the grand prize of the new Apple iPad. Students earn an entry for each hour that they read. 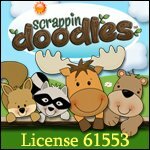 Membership to the Homeschool Buyers Co-op is free. 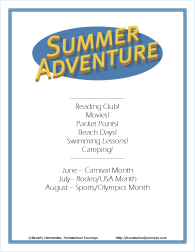 As your students are reading for Homeschool Journeys’ Summer Reading Club, in addition to listing the books on the Summer Reading Club Form, keep track of the time they read and log the hours at the Homeschool Buyers Co-op.